Dashboards are typically on page, visual depictions of key performance indicators (KPI). 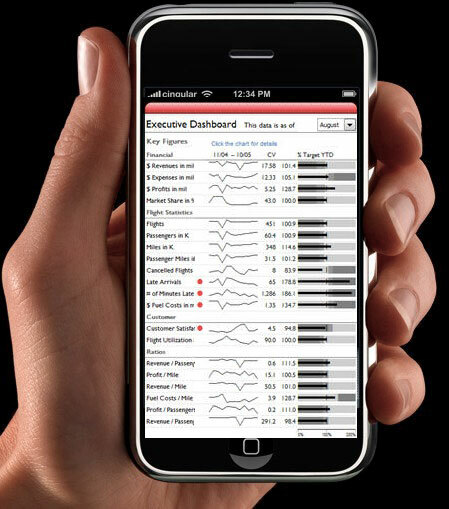 Dashboards allow executives and other leaders to quickly identify areas of concern and success. There is no one way of creating a dashboard but there are some industry standards and best practices. I will cover some of these best practices and give you some valuable resources along the way. As more and more companies come on the scene with "fancy" business intelligence solutions, senior leadership in large corporations are looking back to the old standby Microsoft Excel. Excel is already thoroughly integrated within the majority of corporations and most business professionals are familiar with it in one way or another. Some of Microsoft's changes to Excel (such as improved conditional formatting functionality) lead me to believe that they are ready to put up a fight to win the dashboarding battle. 1. Dashboards go mobile: It is inevitable that dashboards become more mobile and "virtual" to keep up with corporate leader's lifestyles and work habits. 2. Dashboards become forecasting tools: The vast majority of current dashboards show current and historical data but do not offer simple forecasting based on current trends. This can be done in most of the current dashboarding software (including Excel). Xcelsius has begun to make this even easier to implement and more end-user friendly. Dashboard should be laid out anticipating the users eyes will move from left to right. You will not be able to tell the story if your layout is not intuitive. A dashboard should be primarily visual. If you are providing drill downs, detailed data should be provided at a deeper level. End users should select the KPIs that are presented on their dashboard. Attempt to incorporate KPIs that are currently in use and seen as valuable. Four to eight KPIs per tab seems to be most effective. Total number of KPIs on a dashboard should be 25 or less (spread out across 3 to 5 tabs). These are key performance indicators not all indicators. Ideally, KPIs should be "drillable" to access additional detail. Dashboards should be somewhat independent and accessible outside of the dashboarding software used to create them. The dashboard will not be used to its fullest potential if the end user must first log into another piece of software before they can view it.